Click here for more information & pictures. 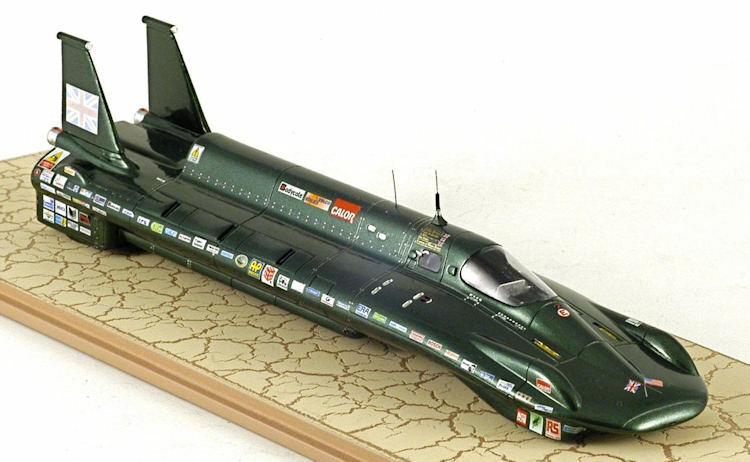 We are currently taking orders for the Model of ‘Inspiration’ the Record Breaking Land Speed Steam Car which is now being manufactured and will be available in May 2010. Why not take this opportunity to promote your company and personalise the model with your company logo and packaging, this will make a great gift for you to give your customers/clients, confirming your involvement in this successful project and one of which will be in all the history books in the future! This opportunity is only available on orders for larger quantities. Or if you would like to order a smaller quantity why not place your order today for the model of the Steam Car complete with logo’s. Visit www.steamcar.co.uk – model to place a single order. Ten years ago an ambitious project to claim the world speed record for a steam-powered car was unveiled at the flagship branch of Selfridges in Oxford Street, London from 28th June 2010, the British Steam Car will be on display at Selfridges having secured no fewer that five speed records, including the world land speed record at 139.843mph, in August 2009. The Chairman of Selfridges says: "To have this impressive car on display will continue the tradition started by Harry Selfridge when he opened this store in 1909. He attracted customers with educational and scientific exhibitions because he wanted shopping to be fun." The British Steam Car, which is 7.7m (25ft) long and weighs three tons, will be exhibited with some of its body panels removed to reveal the complex engineering. There will be footage shown of achieving the world record and record-breaking driver, Don Wales will make a special appearance on Thursday 1st July 2010, and members of the British Steam Car team will available to answer questions. Charles Burnett III, who backed the project and secured the world speed record, says: "Louis Blériot's monoplane was exhibited at Selfridges after his successful first cross-Channel flight in 1909 so it seems appropriate to display the British Steam Car 100 years later." Meanwhile, the 15-person British Steam Car Team, who overcame numerous setbacks to achieve the records, has recently been awarded the Royal Automobile Club Simms Medal for 2009. The medal is named after the Club’s founding member, Frederick Simms, and is awarded to recognise a genuine contribution to motoring innovation by individuals or small companies that also exemplify the spirit of adventure. The British Steam Car Team was one of over 40 companies and organisations in the running for the medal and the award was dedicated to the late Frank Swanston who was the Project Manager for many years but sadly died in August 2007. Previous winners of the medal include BAR Honda and Ford Motor Company Group Vice President and Chief Technical Officer, Richard Parry-Jones. The team was presented the medal at the RAC Club, Pall Mall on 1 June 2010. For the British Steam Car to appear at public events, the team relies on sponsorship and the sales of merchandise to fund its tour. From the outset of the project, one of the goals was to inspire young people and students by stimulating interest in engineering and technology, hence her name “Inspiration”. Her first national public event was at the Autosport International Show last weekend, and whilst the car proved a huge visitor attraction, the team was blighted by a burglary. Over £6,000 worth of branded merchandise was stolen. This will have serious repercussions for the on-going tour. As the only retailer of such apparel we would like to appeal to everyone, if you see steam car team merchandise on sale, please report it to us! It is extremely important for projects such as the steam car to be showcased. It brings engineering to life visually, and could help enthuse the next generation of would-be engineers. It is a well-known fact that there is a huge shortfall of engineers in the UK at present and this will widen as the baby boomers retire causing a rapidly diminishing pool of talent. With no funding, or grants the team relies on the goodwill of sponsors and the selling of merchandise to continue its UK tour. This theft really is criminal on so many levels. The car back home in Hampshire, seen here with the crew at the big thankyou party. 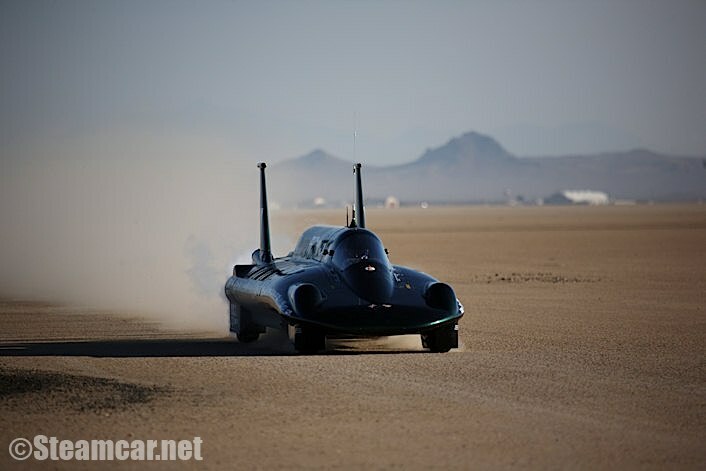 On 25 August 2009 at Edwards Air Force Base in California, USA, the British Steam Car, driven by Charles Burnett III, broke the land speed record for a steam-powered vehicle with an average speed of 139.843mph over two consecutive runs over a measured mile. This record has since been ratified by the FIA. On 26 August 2009 the British Steam Car, driven this time by Don Wales, broke a second record by achieving an average speed of 148.308mph over two consecutive runs over a measured kilometre. This record has since been ratified by the FIA. 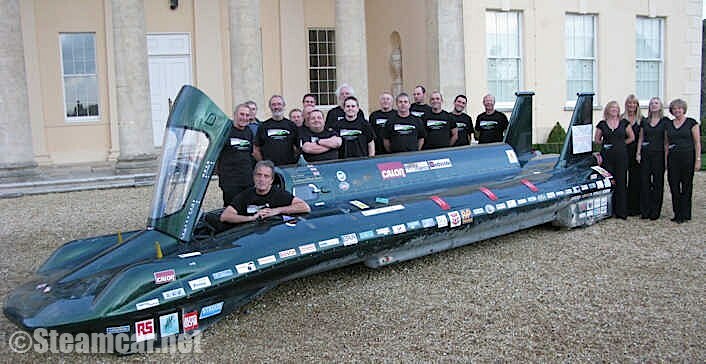 • A Guinness World Record for a measured mile at 139.843mph. Driver, Don Wales, is the nephew of the legendary Donald Campbell, and grandson of Sir Malcolm Campbell. Don holds 11 land speed records, nine in his electric car Bluebird and now two with the British Steam Car Team. The Complete Record Run Diary. 139.843mph for the mile. August 25th 8.19 US time. 148.166mph for the kilometre. August 26th 8.22 US time. From the outset of the project, one of the goals of the British Steam Car team was to inspire young people and students to consider alternative, environmentally friendly methods of propulsion and to 'think outside the box'. The team has received many requests to attend engineering universities as well as high profile science and motoring events to talk about the project and display the British Steam Car. In order to fulfill appearance requests, the British Steam Car team is reliant on sponsorship to cover the expenses involved. After the tour has been completed the British Steam Car will take pride of position at The National Motor Museum Beaulieu as part of their land speed collection. The Mayor of Christchurch, Councillor David Flagg, will be hosting a civic reception for the British Steam Car team to celebrate its success. The Councillor Flagg says: "We're honoured to be the first town to be visited by the steam car and the team involved in setting the world records. I'm sure there will be a lot of interest in seeing this exciting vehicle up close and hearing from the team about their experiences." The British Steam Car Team will be participating in the “Unsung Heroes” Parade – the record-breaking car will make its way up Lymington High Street with members of the team on-board an open top bus. The next appearance will be at the Goodyear Head Office in Birmingham on Wednesday 13 January for which there is a press call and photo opportunity at 12 noon (see below for more details). James Bailey, Communications Manager, Goodyear, says: "As tyre supplier to the British Steam Car team, we congratulate them on their record. This is yet another Land Speed Record for Goodyear, who set a record in 1963 to have the first tyre to exceed 400mph (Craig Breedlove driving Spirit of America). Since then, Goodyear tyres have also been chosen for the British-made JCB DieselMax car, which set a 328mph record for diesel powered vehicles in 2006. We are all looking forward to welcoming the car and team to our head office." The British Steam Car will then be on display as a unique attraction at the Autosport International Show at the NEC from 14 to 17 January (Hall 7, stand numbers 7010 and 7015). Some of the body panels will be removed so that members of the public can see the complex internal arrangement of the British Steam Car. Key members of the British Steam Car team will be available to answer questions, including record-breaking driver, Don Wales and project manager, Matt Candy. As well as the opportunity to sit in the cockpit of the British Steam Car, members of the public can purchase limited edition commemorative merchandise including signed photographs, mouse mats, mugs, t-shirts and 2010 calendars. Footage of the record-breaking runs will be played on the stand. A full three days of activities, where motorsport enthusiasts, event organisers, engineering and restoration companies and the supporting trades are brought together in a relaxed atmosphere to discuss business and competition for the season and to promote events and services. Over 24,000 visitors in total and hundreds of exhibitors make this the Premier European Historic Motorsport Show, covering cars and bikes from eight decades. The money raised from ticket sales will assist with the continuation of the Team's UK Tour. Get up-close and personal with the record-breaking land speed car "Inspiration"
Followed by a talk by members of the record-breaking team including: driver Don Wales, Project Manager Matt Candy & Team Manager Lynne Angel. Driver Don Wales is the nephew of the legendary Donald Campbell, and grandson of Sir Malcolm. Don holds 11 land speed records, nine in his electric car "Bluebird" and two with the British Steam Car Team. You can book tickets now - details over on the 'Official Merchandise' page. Compare the contrast for yourself 150 years of steam technology – from HMS Warrior 1860 the sail and steam powered warship, to a special appearance from the 2009 land speed record breaking British Steam Car! The age of steam - modern and old will be bought to life with talks from Don Wales the land speed record breaking driver and his team, displays of traction engines and road locomotives at work, steam wagon rides, model boat and railway exhibitions and a host of Victorian dock characters. Discover the history of Portsmouth Dockyard as one of the greatest industrial complexes in the world throughout the 18th and 19th centuries with a visit to the Dockyard’s Block Mills*, Dockyard Apprentice exhibition and saw bench and stone crusher displays. Then be entertained by brass bands, morris dancers, street entertainment, more steam talks, traditional fairground rides and craft market complete with a bigger and better Real Ale, Cider and Sausage Festival. Plus entrance to the Historic Dockyard attractions** all make for what promises to be a fantastic day out for all the family! National Museum Beaulieu "Steam Revival"
2010 at Beaulieu sees a reprise of the steam events that were so popular during the early years of the Beaulieu attraction. Beaulieu is now delighted to announce a brand new show on their calendar, the Beaulieu Steam Revival, taking place in the grounds of the National Motor Museum on the 5th and 6th June 2010. Among the major attractions on display will be the magnificent Showman's Engines that could be widely seen at the Fairgrounds of the Victorian era. The show will have its own Victorian Fairground with traditional steam driven rides including Gallopers and Speedway, as well as strolling players and side shows, creating the atmosphere of a Victorian travelling fair. Show visitors will see a wide variety of live demonstrations, boiler making and engine restoration in the Foundry and Blacksmith Shop, and in the Saw Mill there will be thatching and timber working, using wood from the Beaulieu Estate. There will also be trailer and steam engine rides for everyone to enjoy. The Beaulieu Steam Revival can be enjoyed as part of a visit to the whole Beaulieu attraction, including the National Motor Museum and World of Top Gear, Palace House and 13th century Beaulieu Abbey. Full details of the dates and venues for the British Steam Car UK Celebration Tour will be announced shortly on the team’s website: www.steamcar.co.uk. The website will also have information about a new merchandise range to include: t-shirts, mugs, mouse mats, downloadable photographs, scale models and a number of collectable British Steam Car products signed personally by driver Charles Burnett III. From the outset of the project, one of the goals of the British Steam Car team was to inspire young people and students to consider alternative, environmentally friendly methods of propulsion and to 'think outside the box'. The team has received many requests to attend engineering universities as well as high profile science and motoring events to talk about the project and display the British Steam Car. In order to fulfill these requests, the British Steam Car team is seeking sponsorship to cover the expenses involved. It would therefore like to hear from business managers and individuals who wish to be associated with this highly successful project and benefit from the considerable exposure it continues to attract. After the tour has been completed the British Steam Car will take pride of position at The National Motor Museum Beaulieu as part of their land speed collection. The National Motor Museum Beaulieu collects preserves and presents to its visitors vehicles and other items related to the history of motoring in Great Britain from 1895 to the present day. Among its exhibits are Land Speed Record holders: Malcolm Campbell's 1925 350HP Sunbeam, Henry Segrave's 1927 Sunbeam 1000 hp and 1929 Golden Arrow and Donald Campbell's Bluebird CN7. The collection is an amazing testament to the braverey, determination, and technological innovation of these British Speed Kings. The British Steam Car Team would like to extend its appreciation to its sponsors and supporters. In particular Micro Movements and Goodyear who have kick started our UK tour with financial sponsorship. Congratulations to Rebecca Nicholls who has kept us informed about the Land Speed Record Car.